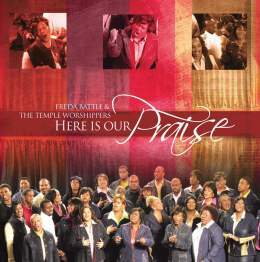 With over 25 years in music ministry and nearly 200 songs to her credit, Freda Battle is no stranger at all. The prolific Boston native now adds to her credit her second release with her choral aggregation The Temple Worshippers, titled Here Is Our Praise. This Axiom Records release is the follow-up to the group’s impressive 2002 release, Serious Praise (read review). Without question, praise and worship afficionadoes will quickly be drawn to this project, as the 13-track effort is one of the strongest offerings of the year. Penning nine of the thirteen tracks, Battle displays her heart for worship with an infectious set of material that will both encourage the believer and create an authentic atmosphere for worship to the Father. Battle enlists the assistance of Israel Houghton’s production, who himself is arguably the most noticeable praise and worship leader of the last five years. Houghton produces the lion’s share of the project, handling duties for ten of the thirteen songs. In addition, he joins April Thompson on lead vocals to the terrifically encouraging “I Know The Plans“, based on Jeremiah 29:11. Continuing a strong scriptural vibe, check out “Over and Over Again”, with its incredibly infectious hook (based on a text from Ephesians 3). Longtime Commissioned contributor Parkes Stewart makes a guest appearance on “Right At Home/I Love”, showing that he can hang with the best in the praise and worship field. Guaranteed hits include “Sing For Joy” (featuring the always wonderful Daniel Johnson), “Psalm 47”, “How Great is Our God” and the formidable title track that latches into your musical memory and won’t let go. Clarence “Tank” Powell takes the mic on Psalm 47, and also on “And Praise”, together with Battle. The diversity on this effort is undeniable and will lock you in for an impacting and powerful 70-plus minute ride that will take your devotion period to a new level. Simply put, Battle and the Temple Worshippers have a sure fire hit on their hands.